PITTSBURGH — Practice makes perfect - or at least that's what we're told as we struggle through endless rounds of multiplication tables, goal kicks and piano scales - and it seems, based on the personal experience of many, to be true. That's why neuroscientists have been perplexed by data showing that at the level of individual synapses, or connections between neurons, increased, repetitive stimulation might actually reverse early gains in synaptic strength. Now, neuroscientists from Carnegie Mellon University and the Max Planck Institute have discovered the mechanism that resolves this apparent paradox. The findings are published in the Jan. 4 issue of Science. The mechanism further explains how brain synapses strengthen in response to new experiences. 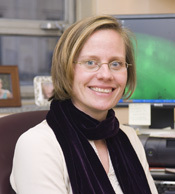 Previous research by Carnegie Mellon researcher and lead author of the study Alison Barth has shown that there is a connection between synaptic plasticity, or changes, and learning and memory. However, little was known about the mechanisms that underlie learning that occurs over longer timeframes, with continuing training or practice. Scientists have shown that N-methyl-D-aspartate (NMDA) receptors are required to initiate synaptic plasticity in this mechanism, a fact that holds true in many areas of the brain. Indeed, it is becoming increasingly clear that these receptors are required for the kind of synaptic strengthening that occurs during learning. Barth and colleagues discovered that the NMDA receptors undergo a sort of Jekyll-and-Hyde transition after an initial phase of learning. Instead of helping synapses get stronger, they actually begin to weaken the synapses and impair further learning. According to Barth, scientists knew that logically, after an initial learning or training experience, this change in receptor function and resulting synapse deterioration would mean that learning would stop, and perhaps with continued stimulation neural processes might even degrade - but experience showed that that wasn't the case. "We know intuitively that the more we practice something, the better we get, so there had to be something that happened after the NMDA receptors switched function which helped synapses to continue to strengthen," said Barth, an assistant professor of biological sciences at the university's Mellon College of Science. Barth chose to look at the cortex, an area of the brain responsible for a slower form of learning that can improve with additional training, or experience. She notes that this brain area may use very different molecular mechanisms than other forms of short-term, episodic memory like those that may occur in the hippocampus. In a series of experiments the researchers blocked different receptors, including NMDA, to see the receptors' effect on long-term neural stimulation. They found that while the NMDA receptor is required to begin neural strengthening, a second neurotransmitter receptor - the metabotropic glutamate (mGlu) receptor - comes into play after this first phase of cellular learning. Using an NMDA antagonist to block NMDA receptors after the initiation of plasticity resulted in enhanced synaptic strengthening, while blocking mGlu receptors caused strengthening to stop. The Carnegie Mellon researchers tracked the changes in the neurons by using a transgenic mouse model that Barth created. In the model, a mild sensory imbalance is created by allowing the mouse to sense its surrounding through only one whisker. Whiskers are useful in studying sensory plasticity because, like human fingers, each whisker is linked to its own unique area of the brain's cortex, making it easy to monitor activity and changes. Limiting the mouse's ability to sense its surroundings through only one whisker causes a sensory imbalance leading to increased plasticity in the cortex. "The neural mechanisms of learning and memory have been poorly understood," said Barth. "Establishing the relationship between NMDA and mGlu receptors will allow us to better understand how we learn and perhaps may help us better understand diseases where learning and memory is lost, as in Alzheimer's disease." Coauthors of the study include Roger L. Clem, a graduate student in the Department of Biological Sciences and the Center for the Neural Basis of Cognition at Carnegie Mellon, and Tansu Celikel of the Department of Cell Biology at the Max Planck Institute for Medical Research. The study was funded by the National Institute of Drug Abuse.